In October of 2013 the American Council for an Energy Efficient Economy (ACEEE) and Energi Insurance Services, with support from the National Renewable Energy Laboratory (NREL), Argonne National Laboratory, and the US Department of Energy (DOE), brought together a group of stakeholders to discuss issues facing small- to mid-size lenders in the energy efficiency space. 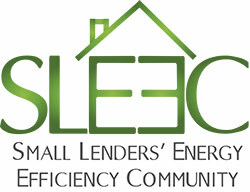 This gathering was called the Small Lender Energy Efficiency Convening and from this SLEEC was born. This page is intended to serve as a repository for technical assistance and other relevant information for lenders interested in energy efficiency. Below are links to research reports, blog posts, fact sheets, and webpages, from ACEEE and others brought together in one place to aid and inform those interested the energy efficiency finance marketplace. For more information on SLEEC, please reach out to the Economics and Finance Policy Team. Also join our online community on LinkedIn. Engaging Small to Mid-Size Lenders in the Market for Energy Efficiency Investment: Lessons Learned from SLEEC, ACEEE. This white paper covers the findings and discussions from the first SLEEC meeting in 2013, the report addresses the opportunities and challenges for small to mid-size lenders in entering the energy efficiency space. There is also a focus on the ways that technical assistance, policy, research and private sector product development can catalyze market activity. Notes and Key Findings from the 2014 Multifamily SLEEC Meeting, ACEEE. This document summarizes central issues discussed in the 2014 multifamily SLEEC meeting. The memo addresses key barriers and strategies for the multifamily finance market, and shares insights into the next steps forward for this space. 5 Key Lessons from SLEEC, ACEEE. This blog post shares initial impressions from the first SLEEC gathering and summarizes the five key lessons. New Lessons on Driving Demand for Energy Efficiency Financing, ACEEE. This follow-up blog post summarizes further lessons learned from SLEEC and explains next steps. Financing Energy Efficiency, ACEEE. Fact page outlining a general overview of energy efficiency finance, a good start if you are just getting to know the marketplace. Energy Efficiency Finance 101: Understanding the Marketplace, ACEEE. This white paper provides more in-depth explanations of the various market actors and mechanisms for delivering energy efficiency finance. Energy Efficiency Finance Joins the Starting Line-up, ACEEE. Blog post discussing the importance of energy efficiency finance, and why it is starting to get more attention. What Have We Learned from Energy Efficiency Financing Programs? ACEEE. This report contains a series of case studies on energy efficiency financing programs across the country. Focus is on utility financing programs. The Role of Appraisals in Energy Efficiency Financing, Building Industry Research Alliance, NREL & DOE. Report addressing challenges to financing energy efficiency, specifically focuses on the importance of standardized reporting of energy efficiency benefits in order to achieve better valuation of properties. Recognition of Energy Cost and Energy Performance in Real Property Valuation, IMT & Appraisal Institute. Further discussion of the importance of proper valuation and appraisal when addressing energy efficiency finance. Green Building and Property Value, IMT & Appraisal Institute. This report discussing ways in which to determine the value of green buildings and energy efficiency improvements. A Funny Thing Happened on the way to Finance Forum: The WHEEL Deal, ACEEE​. Blog post explaining WHEEL. On-Bill Financing, ACEEE. General overview of what on-bill financing is and how it works. On-Bill Financing for Energy Efficiency Improvements, ACEEE. This report gives a more in-depth look at on-bill financing models, hurdles to overcome, and best practices moving forward. Property Assessed Clean Energy (PACE), ACEEE. This page provides a general overview of what PACE is and how it works. Setting the PACE: Financing Commercial Retrofits, Johnson Controls. Report on the benefits and history of PACE financings, specifically this paper looks at commercial PACE and the barriers the market will face as well as way to overcome these barriers. Green Leasing – Fact Sheet, ICLEI & IMT. Fact sheet from ICLEI and IMT providing a general overview of green leasing. Engaging as Partners in Energy Efficiency: Multifamily Housing and Utilities, ACEEE. Report on the current state of multifamily energy efficiency, market potential, and barriers to address. Partnering for Success: An Action Guide for Advancing Energy Efficiency Funding for Multifamily Rental Housing, National Housing Trust. Step-by-step guide detailing strategies for overcoming barriers to implementing energy efficiency in multifamily buildings. Transforming Multifamily Housing, Fannie Mae. Fannie Mae’s Green Initiative and Energy Star® for Multifamily: Fact sheet on Fannie Mae’s Green Initiative for multifamily housing; includes information on the new Energy Star® rating system for multifamily buildings. Multifamily Savings Project, ACEEE. Link to ACEEE’s multiyear project on promoting energy efficiency in multifamily buildings. For more information on the topic check out the multifamily resource library. Financing for Multi-Tenant Building Efficiency, ACEEE. This report discusses barriers and strategies to overcome for financing energy efficiency in multitenant buildings. Navigating the Financing Labyrinth: Approaches to Funding Energy Efficiency in Commercial Buildings, STAMATS. Report on funding strategies and various financing mechanisms best suited for commercial properties. Emerging Best Practices for Underwriting Commercially-Attractive Energy Efficiency Loans, Building Energy Performance Assessment News. This paper discusses best practices for underwriting energy efficiency loans in commercial properties. United States Building Energy Efficiency Retrofits: Market Sizing and Financing Models, Deutsche Bank & Rockefeller Foundation. Deutsche Bank and Rockefeller Foundation report that estimates the market potential for energy efficiency financing and highlights effective financing mechanisms that can be utilized to scale the market. Show Me the Money: Energy Efficiency Financing Barriers and Opportunities, Environmental Defense Fund. Environmental Defense Fund reports that further highlights key barriers and strategies for implementing energy efficiency financing programs. Innovations and Opportunities in Energy Efficiency Finance, WSGR. Concise report summarizing several major financing mechanisms for energy efficiency and the specifics for implementing such mechanisms in each sector. A Glossary of Energy Efficiency Financing Tools, Economic Opportunity Studies, Inc. Detailed glossary of several key energy efficiency finance terms. The Bottom Line on: Public Private Finance Tools for Energy Efficiency, World Resource Institute. Q&A style fact sheet from the World Resource Institute on energy efficiency finance. Energy Efficiency Paying the Way: New Financing Strategies Remove First-Cost Hurdles, CalCEF Innovations. This report discusses several case studies looking at successful programs across the country with no-first-costs financing models. Investor Confidence Project. The Investor Confidence Project is project developed by the Environmental Defense Fund that establishing protocols for reporting financial performance and other relevant data from energy efficiency projects to enhance underwriting and management of performance risk. Buildings Performance Database. This U.S. Department of Energy tool allows users to perform statistical analyses on anonymous data from hundreds of thousands of commercial and residential buildings.